“Love In Deed” is a sweet and clean romance, with themes of love and loss, conflict, faith, family and, ultimately, forgiveness. Abbie Chase is sure her shy boyfriend, Dan Stephens, is about to propose marriage. Instead, they’re forced apart by an ultimatum issued by Dan’s father. When an ill-considered deed brings them face to face again, Dan’s matchmaking cousin urges them to make the most of the situation. As a marketing writer in Orlando, Florida, Abbie finds it easy to avoid Dan, who is a construction worker in San Diego, California. But the fact that he’s out of sight doesn’t keep thoughts of him out of her mind. The unwanted attention of a new graphics designer in her office compels her to resurrect her relationship with Dan — at least on paper — to keep her coworker at arm’s length. Even though Dan feels he has no choice but to break up with the girl of his dreams, he never stops loving Abbie. When he inadvertently learns about her fake-boyfriend ruse, he volunteers to step into the role of the man who loves her, hoping the pretense will one day become a reality. Annette Savage Williams is no stranger to the literary world. She has worked in the realm of publishing in her small San Diego County hometown for more than 14 years, earning numerous writing awards in San Diego Press Club’s Excellence in Journalism competitions. She has self-published three nonfiction books and has edited novels and nonfiction books for a number of San Diego County-based writers. Ramona Home Journal article here. Buy Love In Deed, here. 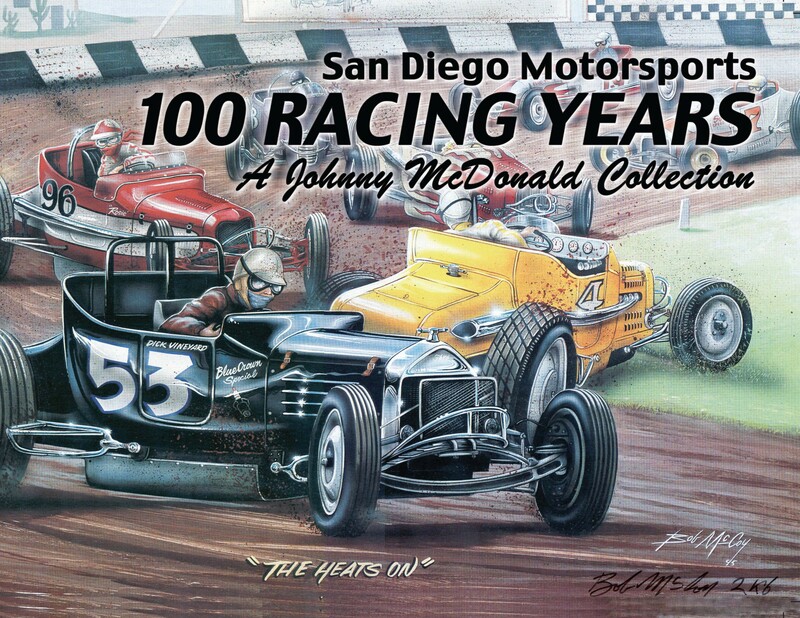 “San Diego Motorsports 100 Racing Years — A Johnny McDonald Collection” was originally published in 2008. Today, it is back in print, complete with the original front and back cover art by the late Bob McCoy. The book begins in 1907, with the antics of Barnstormin’ Barney Oldfield, and continues through the years, with coverage of racing exploits in San Diego, Balboa Park (including a race in conjunction with the 1915 Panama-California Exposition, now celebrating its centennial), Barona, Carlsbad, Chula Vista, Coronado, Del Mar, El Cajon, La Jolla, Lakeside, Miramar, Mission Bay, Mission Beach, National City, Pacific Beach, Point Loma, Otay Mesa, Ramona, Torrey Pines, Riverside, Los Angeles, Beverly Hills, Long Beach, Maywood, Hollywood, Baja California and beyond. 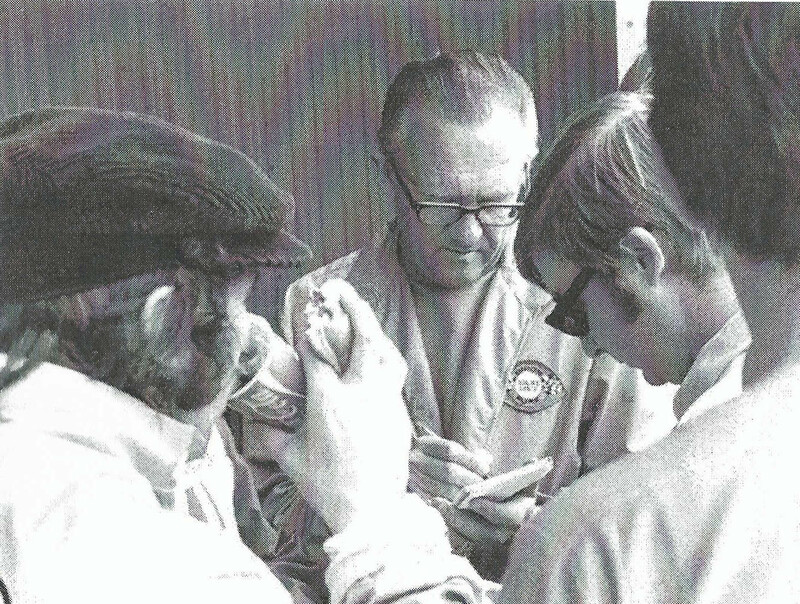 McDonald focuses on such well-known personalities as Jerry Baltes, “Wild” Bob Burman, “Bad Bill” Carlson, Earl Cooper, Raffaele “Ralph” DePalma, “Rajo” Jack DeSoto, Chet Gardner, Al Gordon, Dan Gurney, Jimmie Johnson, Parnelli Jones, Earl Mansell, Rex Mays, Curly Mills, Roger Penske, Don Prudhomme, Eddie Rickenbacker, Ivan “Ironman” Stewart, Mickey Thompson and many others, along with future actress Raquel Welch, the San Diego beauty queen who awarded trophies to race winners. In addition, the author puts the spotlight on every type of racing you can imagine, including auto, hot rod, midget, jalopy, sports car, modified and drag, along with motocross, supercross, dune buggies, stock cars, hydroplanes and monster trucks. “San Diego Motorsports 100 Racing Years” is filled with hundreds of historic photos of major people and events from McDonald’s own collection, which includes more than 800 auto and motorcycle racing images and countless programs, press kits and other memorabilia, all made possible by the author’s vast and varied career. Johnny McDonald, a San Diego County-based writer, has a passion for automobiles and racing that hasn’t diminished in his 60-plus-year writing career. His articles and stories have appeared in both national and regional publications, prompting “Car and Driver” magazine to describe him as one of the nation’s most influential motorsports writers. Through the years, McDonald has covered 10 Indianapolis 500s, five Daytona 500s and more than 100 motorsports events in the West. He served three years as president of the American Auto Racing Writers and Broadcasters Association and founded the All-American driver team, now in its 43rd year as of 2015. McDonald is an award-winning writer for Ramona Home Journal, which features his column “Behind the Wheel;” has worked on the public relations staffs at Del Mar and Qualcomm Stadium; is a former marketing director at the San Diego Automotive Museum; and has served as a consultant for the Hall of Champions, where he established a permanent display on motorsports. In addition, he has publicized and promoted motorsports events at six Southern California fairs. “I look back and wonder how I did so many things!” he said. In addition to “Under the Green: A Guide to Auto Racing,” for which he was honored in 1977, he was co-author of “Green Dragons of World War II.” He is also a winner of numerous awards in San Diego Press Club Excellence in Journalism competitions. McDonald lives in San Diego, Calif., and has been married 59 years to his wife, Maxine. They are the parents of two sons and two daughters, and have eight grandchildren. In the years between 1958 and 1965 trophy queens handed out the trophies to the winners of the car races in San Diego. Any one know the stage name of the trophy queen from La Jolla High that handed out the trophies to the race car winners? Raquel Welch. Did you know that in 1934 there was a Midget race car track at the foot of Broadway? Do you know what the location became? Lane Field. In 1915 there was an auto race on the dirt streets of Point Loma to promote what Exposition? California Pan-American Exposition.